This bright hue is sure to add a little spring to your step as the workweek begins again! ahhh!!! I want those hunter boots! oh how I love those!!!! happy Monday to you! so fun and cheery. loving all the red, but i can't remember the last time i wore it. maybe it's time. Tina-so glad you are enjoying them! 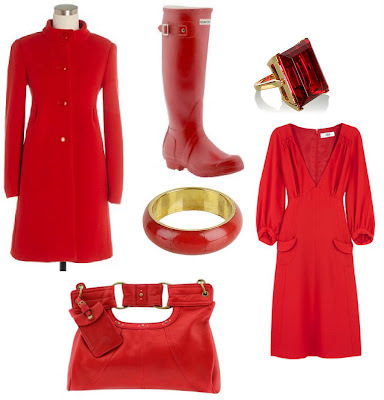 Oh, I want a bright red coat! It's so cheerful. I promise I will wrap it up and put it under the tree..I said to my husband. i'll take the boots . . . um, throw in the ring while you're at it! love this everything red post! Oh, I LOVE the red! This was so so cheerful to see in my reader on a grey and dreary day. I rarely wear red, but I've been craving it lately. I would take one of everything! can i have one of each please! Mmm...Hunter boots. I'm trying to convince myself that I need them now that we live in a place where it rains all winter. I need them, right? Right? Need.